Jovis, 25 die Februarii; Anno 11 Georgii IV ti Regis, 1830. Cork City Election- Consideration of Petition, adjourned. Names of Absent Members to be reported, &c.
House to be called over. Mr. Speaker directed the Clerk to read the Order of the day for taking the said Petition into consideration; and immediately adjourned the same till To-morrow, at three of the clock in the Afternoon. Resolved, That when the House shall have proceeded, To-morrow, to the appointment of a Select Committee for trying and determining the merits of the Petition complaining of an undue Election and Return for the city of Cork, and the Names of the Members shall be drawn and called for that purpose, Mr. Speaker do direct the Name of every Member so called, who shall be absent from the House, to be set aside; and that a List of the Names of such absent Members be reported by Mr. Speaker to the House, at such time as the House shall think fit to appoint. 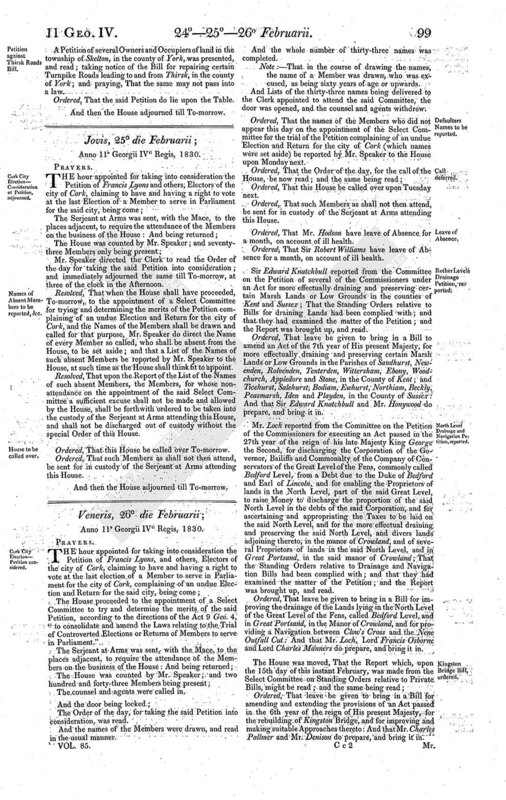 Resolved, That upon the Report of the List of the Names of such absent Members, the Members, for whose nonattendance on the appointment of the said Select Committee a sufficient excuse shall not be made and allowed by the House, shall be forthwith ordered to be taken into the custody of the Serjeant at Arms attending this House, and shall not be discharged out of custody without the special Order of this House. Ordered, That this House be called over To-morrow. Ordered, That such Members as shall not then attend, be sent for in custody of the Serjeant at Arms attending this House.